1933 Lower East Side Manhattan- This is a story of a little girl named Boy who decides one day to leave the life of an abused Caucasian child in search of beauty and freedom at a boardinghouse for coloured woman in Massachusetts. In this story there are racial dynamics that are rarely contemplated let alone written about within literary fiction. The writing is highly imaginative, elegant, resonant, and its innovation goes beyond the realms of my bookshelves. This book was so compelling that upon completion I had to reread some of the earlier passages to confirm my shaky comprehension, after doing so I was still not all that convinced. This story is a rehashing of some of fairy tales more important symbols in a magically realistic environment. While reading at times the references to tokens of enchantments seemed a little forced to fulfill some of the standard protocol that constitutes this genre, in the end it eventually came together. I felt this story to be based on perception vs. reflection vs. reality and the strive for objectivity. Throughout this story these themes seem to manifest with respect to a characters insecurity, vanity or shame. One instance of misunderstanding happens when a character is deliberating that after a prolonged period of unhappiness she is transfixed by the new reality that she can smile again. The other character perceives this as vanity when in reality the character wants to understand all the mental and physical feelings involved with how a smile emanates from a life long of dormancy. 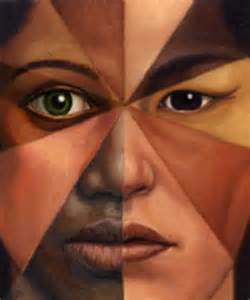 Another object of reality found in the immediate family is that of interracial prejudices. Darker shades of pale, different shades of black. The underlying but pronounced feeling of “colourism” within the Whitman family was one that should not be taken lightly by the reader. Although less prevalent in the 20th century the idea that lighter is treated more favourably than darker is a controversial topic addressed in this story. Fairy Tales are regarded as an efficient demonstration in moral values for educating the youth of the world. This story being best suited for adults could be regarded in the same genre. Philosophers view fairy tales as a way of espousing lies and enabling a harmful way of affecting the way a child views the real world. From my perspective it is a perfect way to educate them in a way that is not so plain or ordinary, but beware the old tradions. Think of the literary equivalent of blending broccoli into a tomato sauce to ensure the consumption of nourishing vegetables; brain food and they didn’t even realize. Boy,Snow,Bird reinforces the power of magical realism in the way readers gain a better understanding of social and humanity problems that have troubled this planet for all these years. One aspect of the book that I disliked was that of the very leading conclusion. 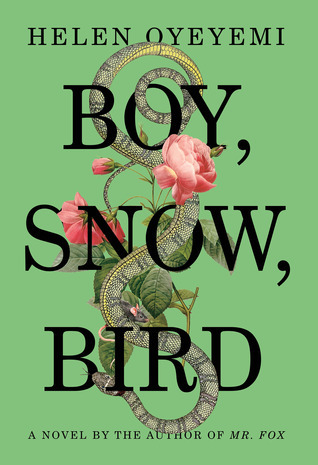 I understand when author’s let the audience draw their own conclusions, but if there was ever a novel that required more, it was Boy,Snow,Bird. There is a general consensus fluttering around in my head, but it never settles due to the unanswered questions. Of course it definitely adds to the mysticism and maybe my lack of knowledge and experience with fairy tales is rearing its ugly head, but I would have liked a little bit more. I recommend this book to people that enjoy a socially conscious and challenging read to upset the queue in your next “to read” selections. If you’re like me this will not be like many books you have read and requires a narrow focus but wide perspective. Enjoy!!! !